We’re sharing one of our favorite dishes with you today – Pasta L’uva with Gorgonzola. This dish is a wonderful combination of flavors – and it’s gorgeous to look at as well! 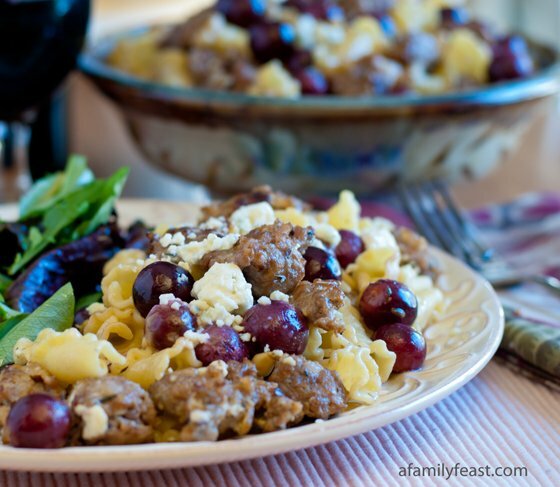 Pasta is tossed with sweet Italian sausage, caramelized onion, creamy gorgonzola cheese, a sprinkle of toasted pine nuts – and the best part of this recipe – sweet, pan-roasted grapes. If you’ve never eaten roasted grapes before, you really must try them! Roasting the grapes brings out the natural sweetness of the fruit as it caramelizes from the heat. The skin of the grape softens and the inside, depending on how long you roast or sauté it, becomes soft and almost jam-like in consistency. This recipe for pasta l’uva (l’uva means ‘grape’ in Italian) with gorgonzola was inspired by dishes we’ve eaten in the past at two local restaurants in the Cape Cod, Massachusetts area – both of which are sadly, no longer in business. The first restaurant served a dish with pasta, roasted grapes, walnuts, and a melted gorgonzola cream sauce. The gorgonzola and grape combination alone is a winner – the flavors of the tangy cheese and the sweet grapes are perfect complements to each other. The second restaurant combined pasta with Italian sausage and roasted grapes – another winning combination with the savory spiciness of the sausage nicely balanced by the sweetness of the grapes. Our dish combines the best of these two dishes into one, and we think you’ll make this delicious recipe again and again. While the pasta is cooking, in a small dry sauté pan, over medium heat, toast the pine nuts until very lightly brown. Remove from the heat and let cool. In a large skillet, heat the olive oil over medium-high heat. Add the onion and garlic and sauté for about 2 minutes, stirring constantly. Add the sausage to the onion mixture, crumbling the meat into bite-sized pieces. Continue to cook on medium to medium-high heat, stirring frequently and allowing the sausage to completely cook and brown up, and the onions to caramelize. Add the thyme and the grapes and sauté for 5-7 minutes until the grapes begin to roast in the pan and soften. When the pasta is cooked, drain well and add to the skillet with the sausage-grape mixture. Add the gorgonzola and pinenuts. Stir until the cheese has completely melted and coated the pasta. Several years ago I ate at a restaurant in Franklin, NC called Frog and Owl Bistro. They had a pasta with gorgonzola and grapes dish that I enjoyed so much. But I live in South Dakota so eating it again is really not an option. I was searching for a recipe similar to it, and I am glad I ran across your recipe. I made it for supper this evening and my husband and I both really enjoyed it! It tasted like we were eating in some fine Italian restaurant. It was completely different than what I had ordered in NC, but was WONDERFUL and so EASY! I plan to make it over and over again. Thank you for posting it! Hi Sarah – Thank you so much for writing to us! We’re very happy you enjoyed the recipe!